Melbourne-based, Meditation Solutions specialises in meditation and mindfulness training for groups and individuals, offering workplace and public courses and workshops and private consultations. We aim to teach meditation and mindfulness for relaxation, health and clarity of mind, in a way that is accessible to people who are new to meditation. Our approach is practical, straightforward and nonreligious. We regard meditation as a skill that people can understand for themselves and practise anywhere. Meditation Solutions is one of several Australian meditation training providers nationwide who share this approach. 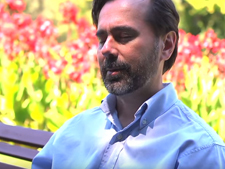 Please view this 5 minute mindfulness meditation, guided by Meditation Solutions director, Paul Majewski. 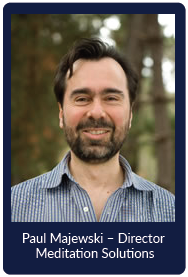 Paul Majewski, director of Meditation Solutions, has taught meditation and mindfulness in a wide variety of settings, including the legal, medical and rehabilitation fields, in Melbourne, Canberra and Perth, since 1994 and trained for seven years with Eric Harrison at the Perth Meditation Centre. Paul is also a partner in Meditation Events, organisers of the Australian Meditation Conference (2008-2011), and is vice-president of the Meditation Association of Australia, the national peak body representing meditation teachers and promoting the practice of meditation in Australia and organisers of the upcoming Australian Meditation Conference.